Избранные публикации за 2000 — 2014 гг. J. Phys. Chem. A, 2018,122 (16), 4042–4047. Intermolecular complexes between CHF3 and CO have been studied by ab initio calculations and IR matrix isolation spectroscopy. The computations at the MP2 and CCSD(T) levels of theory indicated five minima on the potential energy surface (PES). The most energetically favorable structure is the C(CO)–H(CHF3) coordinated complex (Cs symmetry) with the stabilization energy of 0.84 kcal/mol as computed at the CCSD(T) level (with ZPVE and BSSE corrections). This is the only structure experimentally found in argon and krypton matrixes, whereas the weaker non-hydrogen-bonded complexes predicted by theory were not detected. The vibrational spectrum of this complex is characterized by a red-shift of the CF3 asymmetric stretching, splitting of the C–H bending mode, and blue-shifts of the C–H and C–O stretching vibrations as compared to the monomer molecules. The observed complexation-induced shifts of CHF3 and CO fundamentals are in good agreement with the computational predictions. It was shown that both MP2 and CCSD(T) calculations generally provided a reasonable description of the vibrational properties for the weak intermolecular complexes of fluoroform. J. Phys. Chem. B 2018, 122(6), pp. 1992-2000. Ionic liquid/crown ether compositions are an attractive alternative to traditional extractants in the processes for spent nuclear fuel and liquid radioactive wastes reprocessing. These compositions are exposed to ionizing radiation, and their radiation stability, especially in the presence of metal salts, is a crucial issue. In the present study, the macrocyclic 18C6·Sr(BF4)2 and 18C6·Sr(PF6)2 complexes simulating the components of metal loaded ionic liquid/crown ether extractants were synthesized and their structures were characterized by FTIR spectroscopy and single-crystal X-ray diffraction analysis. Inclusion of Sr2+ cation into the 18C6 cavity resulted in more symmetric D3d conformations of the macrocycle. The structural transformations of the crown ether were accompanied by an elongation of polyether C—O bonds that could increase the possibility of radiolytic cleavage of the macrocycle. However, EPR study of the synthesized compounds subjected to X-ray irradiation revealed predominant formation of macrocyclic −CH2–ĊH–O– radicals. This result demonstrated an evidence for indirect action of ionizing radiation on individual components of the complexes and was reasonably described by a positive “hole” transfer from primary macrocyclic radical cation to fluorous anion at the primary stages of radiolysis and a subsequent interaction of fluorine atom with 18C6 macrocycle in secondary radical reactions. The observed effects may be partially responsible for enhanced sensitivity of the ionic liquid/crown ether extractants to ionizing radiation due to chemical blocking of the crown ether with radiolytic HF, radiation-chemical degradation of the 18C6, and precipitation of a low-soluble SrF2. J. Am. Chem. Soc. 2017, 139, pp. 9551–9557. Conformers of carboxyl radical (HOCO) have been studied by IR spectroscopy in argon and nitrogen matrices. In an argon matrix, only the lower-energy conformer trans-HOCO is observed, whereas both cis and trans conformers are found for deuterated carboxyl radical DOCO. In a nitrogen matrix, both conformers of HOCO and DOCO isotopologues can be prepared, indicating strong stabilization of the higher-energy cis conformer by a nitrogen matrix. Selective vibrational excitation promotes the trans-to-cis and cis-to-trans conversions of DOCO in an argon matrix and HOCO and DOCO in a nitrogen matrix, which is the first conformational photoswitching of an open-shell species. In a nitrogen matrix, the cis-to-trans and trans-to-cis conversions of HOCO is also found upon broadband IR light of the spectrometer, and the ratio of the quantum yields of these processes is about 3.3. The photoswitching peculiarities are in agreement with the available theoretical energy barriers. The higher-energy cis conformer decays to the lower-energy trans conformer via hydrogen-atom tunneling through the torsional barrier, which is also a unique observation for an open-shell species. The tunneling mechanism of the cis-to-trans switching is supported by the low-temperature limit of the reaction rate and by the H/D kinetic isotope effect. Our results suggest a large difference in the H/D kinetic isotope effects in nitrogen and argon matrices (∼5 and >100, respectively). The stabilizing effect on cis-DOCO by a nitrogen matrix (by 2 orders of magnitude versus an argon matrix) is much smaller than that on cis-HOCO (estimated to be >104). Phys. Chem. Chem. Phys. 2017, 19, pp. 24348-24356. The HCN⋯CO complex and its X-ray induced transformation to HNC⋯CO in solid noble gas (Ng) matrices (Ng = Ne, Ar, Kr, Xe) was first characterized by matrix isolation FTIR spectroscopy at 5 K. The HCN⋯CO complex was obtained by deposition of HCN/CO/Ng gaseous mixtures. The assignment was based on extensive quantum chemical calculations at the CCSD(T) level of theory. The calculations predicted two computationally stable structures for HCN⋯CO and three stable structures for HNC⋯CO. However, only the most energetically favorable linear structures corresponding to the co-ordination between the H atom of HCN (HNC) and the C atom of CO have been found experimentally. The HCN⋯CO complex demonstrates a considerable red shift of the H–C stretching vibrations (−24 to −38 cm−1, depending on the matrix) and a blue shift of the HCN bending vibrations (+29 to +32 cm−1) with respect to that of the HCN monomer, while the C≡O stretching mode is blue-shifted by 15 to 20 cm−1 as compared to the CO monomer. The HNC⋯CO complex reveals a strong red shift of the H–N bending (−77 to −118 cm−1) and a strong blue shift of the HNC bending mode (ca. +100 cm−1) as compared to the HNC monomer, whereas the C≡O stretching is blue-shifted by 24 to 29 cm−1 with respect to that of the CO monomer. The interaction energies were determined to be 1.01 and 1.87 kcal mol−1 for HCN⋯CO and HNC⋯CO, respectively. It was found that the formation of complexes with CO had a remarkable effect on the radiation-induced transformations of HCN. While the dissociation of HCN to H and CN is suppressed in complexes, the isomerization of HCN to HNC is strongly catalyzed by the complexation with CO. The astrochemical implications of the results are discussed. Phys. Chem. Chem. Phys. 2017, 19, pp. 356-365. Vacuum ultraviolet (VUV, 130–170 nm) photochemistry of the H2O⋯CO complex is studied by matrix-isolation infrared spectroscopy. The H2O⋯CO complexes in Ne, Ar, Kr, and Xe matrices are generated by ultraviolet (UV, 193 and 250 nm) photolysis of formic acid (HCOOH). VUV photolysis of the H2O⋯CO complexes is found to lead to the formation of the OH⋯CO radical–molecule complexes and trans-HOCO radicals. It is shown that the matrix material, local matrix morphology, and possibly the H2O⋯CO complex geometry strongly affect the VUV photolysis pathways. The intrinsic reactivity of the matrix-isolated OH⋯CO complex resulting in the formation of trans-HOCO is directly demonstrated for the first time. This reaction occurs in Ar, Kr, and Xe matrices upon annealing above 25 K and may proceed over the barrier. The case of a Ne matrix is very special because the formation of trans-HOCO from the OH⋯CO complex is observed even at the lowest experimental temperature (4.5 K), which is in sharp contrast to the other matrices. It follows that quantum tunneling is probably involved in this process in the Ne matrix at such a low temperature. Infrared light also promotes this reaction in the Ne matrix at 4.5 K, which is not the case in the other matrices. The last findings show the effect of the environment on the tunneling and infrared-induced rates of this fundamental chemical reaction. ChemPhysChem 2017, 18, pp. 949-958. We report on the experimental and theoretical infrared spectrum of the C2H⋅⋅⋅CO2 complex. This complex was prepared by UV photolysis of propiolic acid (HC3OOH) in argon and krypton matrices. The experimental bands of C2H in the C2H⋅⋅⋅CO2 complex are blue-shifted from those of the C2H monomer. The calculations on the C2H⋅⋅⋅CO2 structures were performed at the RMP2/aug-cc-pVTZ level. The relative stability of the complex structures was evaluated by using the RCCSD(T)/aug-cc-pVQZ level. To simulate the spectrum of the C2H⋅⋅⋅CO2 complex, we developed the theoretical approach used earlier for the C2H monomer. Based on the calculations, the main experimental bands of the C2H⋅⋅⋅CO2 complex are assigned to the most stable parallel structure. Almost all the strong bands predicted by theory (with intensities >30 km mol−1) are observed in the experiment. To our knowledge, it is the first study of the effect of noncovalent interactions on vibronic transitions and the first report on an intermolecular complex of the C2H radical. J. Chem. Phys. 2017, 147, 131102. Structure and spectroscopic features of the CF2⋯HF complexes were studied by ab initio calculations at the CCSD(T) level and matrix isolation FTIR spectroscopy. The calculations predict three stable structures. The most energetically favorable structure corresponds to hydrogen bonding of HF to the lone pair of the C atom (the interaction energy of 3.58 kcal/mol), whereas two less stable structures are the H⋯F bonded complexes (the interaction energies of 0.30 and 0.24 kcal/mol). The former species was unambiguously characterized by the absorptions in the FTIR spectra observed after X-ray irradiation of fluoroform in a xenon matrix at 5 K. The corresponding features appear at 3471 (H–F stretching), 1270 (C–F symmetric stretching, shoulder), 1175 (antisymmetric C–F stretching), and 630 (libration) cm−1, in agreement with the computational predictions. To our knowledge, it is the first hydrogen-bonded complex of dihalocarbene. 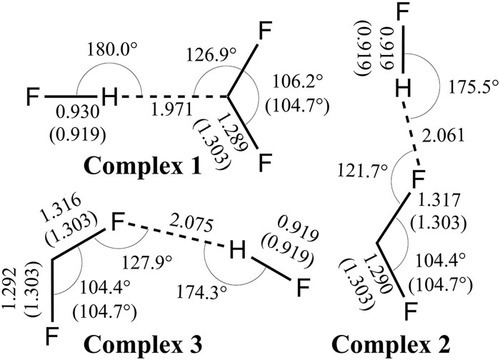 Possible weaker manifestations of the H⋯F bonded complexes were also found in the C–F stretching region; however, their assignment is tentative. The H⋯C bonded complex is protected from reaction yielding a fluoroform molecule by a remarkably high energy barrier (23.85 kcal/mol), so it may be involved in various chemical reactions. Radiation-induced transformations of methanol molecules in low-temperature solids: a matrix isolation study. Phys. Chem. Chem. Phys. 2016, 18, pp. 32503-32513. The effect of X-ray irradiation on methanol molecules (CH3OH, CD3OH, and 13CH3OH) isolated in solid noble gas matrices (Ne, Ar, Kr, and Xe) was studied by FTIR spectroscopy at 6 K. CH2OH•, H2CO, HCO• and CO were found to be the main degradation products. Somewhat unexpectedly, the production of CO is quite prominent, even at low doses, and it strongly predominates in low-polarizable matrices (especially, in neon). This result is explained by inefficient quenching of excess energy in the H2CO molecules initially generated from methanol. Relatively small amounts of CH4, CH3• and CO2 were also observed directly after irradiation. The latter species presumably originates from methanol dimers or methanol–water complexes. The mechanisms of radiolysis and annealing-induced reactions are discussed and possible implications for the astrochemically relevant ices are considered. Matrix isolation and ab initio study on HCN/CO2 system and its radiation-induced transformations: Spectroscopic evidence for HCN⋯CO2 and trans-HCNH⋯CO2 complexes. J. Chem. Phys. 2016, 145, 214309. Spectroscopic characteristics and X-ray induced transformations of the HCN⋯CO2 complex in solid Ar and Kr matrices were studied by FTIR spectroscopy and ab initio calculations at the CCSD(T) level. The complex was prepared by deposition of the HCN/CO2/Ng gas mixtures (Ng = Ar or Kr). The comparison of the experiment and calculations prove formation of a linear, H-bonded NCH⋯OCO complex with a substantial red shift of the C–H stretching band and a blue shift of the H–C–N bending band in respect to the monomer. This result is in contrast with the previous gas-phase observations, where only T-shape complex was found. Irradiation of deposited matrices leads to formation of CN radicals and HNC molecules and subsequent annealing results in appearance of H2CN and trans-HCNH in both matrices plus HKrCN in the case of Kr. In the presence of CO2, the strongest absorption of trans-HCNH radical demonstrates an additional blue-shifted (by 6.4 cm−1) feature, which was assigned to the N-coordinated complex of this radical with CO2 on the basis of comparison with calculations. To our knowledge, it is the first experimentally observed complex of this radical. No evidence was found for HKrCN⋯CO2 complex, which was explained tentatively by steric hindrance. Mechanisms of Radiation-Induced Degradation of CFCl3 and CF2Cl2 in Noble-Gas Matrixes: An Evidence for “Hot” Ionic Channels in the Solid Phase. J. Phys. Chem. A 2016, 120, pp. 7847–7858. The X-ray-induced transformations of simple chlorofluorocarbons (CFCl3 and CF2Cl2) in solid noble-gas matrixes (Ne, Ar, Kr, and Xe) at 7 K were studied in order to elucidate basic mechanisms of the radiation–chemical degradation with possible implications for stratospheric and extraterrestrial ice chemistry. The decomposition of parent molecules and formation of products were monitored by FTIR spectroscopy, and the identification was supported by ab initio calculations at the CCSD(T) level. It was shown that the ionic reaction channels were predominating in most cases (except for CF2Cl2/Xe system). The primary radical cations (CFCl3+• and CF2Cl2+•) are either stabilized in matrixes or undergo fragmentation to yield the corresponding secondary cations (CFCl2+, CCl3+, CF2Cl+) and halogen atoms. The probability of fragmentation through different channels demonstrates a remarkable matrix dependence, which was explained by the effect of excess energy resulting from the exothermic positive hole transfer from matrix atoms to freon molecules. A qualitative correlation between “hot” ionic fragmentation at low temperatures and gas-phase ion energetics was found. However, dissociative electron attachment leads to formation of neutral radicals (CFCl2• or CF2Cl•) and chloride anions. One more possible way of dissociative electron attachment in the case of CF2Cl2 is formation of CF2•• and Cl2–•. A general scheme of the radiation-induced processes is proposed. A. A. Zezin, V. I. Feldman, S. S. Abramchuk, G. V. Danelyan, V. V. Dyo, F. A. Plamper, A. H. Müller and D. V. Pergushov. Efficient size control of copper nanoparticles generated in irradiated aqueous solutions of star-shaped polyelectrolyte containers. Phys. Chem. Chem. Phys. 2015, 17, pp. 11490 - 11498. The formation of copper nanoparticles (Cu-NPs) in irradiated aqueous solutions of star-shaped poly(acrylic acid) (PAA) were studied at two pH values. Transmission electron microscopy (TEM) demonstrates that the star-shaped macromolecules loaded with Cu2+ ions can act as individual nanosized containers providing a perfect control over the size and size distribution of Cu-NPs. Electron paramagnetic resonance (EPR) and optical spectroscopy show a transformation of mechanisms controlling the reduction of Cu2+ ions and the further formation of Cu-NPs. At pH 2.9, Cu-NPs are formed from the aquacomplexes of Cu2+ ions through homogeneous nucleation. At pH 4.3, the formation of Cu-NPs occurs inside macromolecular containers loaded with Cu2+ ions, which are bound to carboxylic groups of the polyelectrolyte. In the latter case, Cu-NPs apparently ripen from preformed hydrated Cu2O seeds, which are thought to result from the ultrasmall (Cu2+)m(OH−)k(COO−)n species, thus implying a heterogeneous nucleation. Radiation-induced transformations of matrix-isolated formic acid: evidence for the HCOOH → HOCO + H channel. Phys. Chem. Chem. Phys. 2015, 17, pp. 30648-30658. The effect of X-ray irradiation on the isolated formic acid molecules (HCOOH) in solid noble gas matrices (Xe, Kr, Ar, and Ne) at very low temperatures (6 K) was first studied by FTIR spectroscopy. Carbon oxides (CO and CO2) and hydrocarboxyl radicals (HOCO) have been detected as the principal degradation products. The formation of HOCO radicals represents a primary dissociation channel for formic acid, which was not reported previously under UV photolysis in solids. This reaction can be explained by the involvement of the recombination-induced excited states, which are not populated in photolysis. The effects of the matrix and the absorbed dose on the product formation were studied in detail and possible mechanisms are discussed with particular attention to the difference between radiolysis and UV-photolysis of the matrix-isolated formic acid. The results obtained provide a new insight into the effects of high-energy impact on the simplest carboxylic acid with possible implications to the astrochemical problems, in particular, the prebiotic evolution in the interstellar medium. Matrix-Isolation Studies on the Radiation-Induced Chemistry in H2O/CO2 Systems: Reactions of Oxygen Atoms and Formation of HOCO Radical. J. Phys. Chem. A. 2015, 119, pp. 2578-2586. The radiation-induced transformations occurring upon X-ray irradiation of solid CO2/H2O/Ng systems (Ng = Ar, Kr, Xe) at 8–10 K and subsequent annealing up to 45 K were studied by Fourier transform infrared spectroscopy. The infrared (IR) spectra of deposited matrices revealed the presence of isolated monomers, dimers, and intermolecular H2O···CO2 complexes. Irradiation resulted in effective decomposition of matrix-isolated carbon dioxide and water yielding CO molecules and OH radicals, respectively. Annealing of the irradiated samples led to formation of O3, HO2, and a number of xenon hydrides of HXeY type (in the case of xenon matrices). The formation of these species was used for monitoring of the postirradiation thermally induced chemical reactions involving O and H atoms generated by radiolysis. It was shown that the radiolysis of CO2 in noble-gas matrices produced high yields of stabilized oxygen atoms. In all cases, the temperatures at which O atoms become mobile and react are lower than those of H atoms. Dynamics and reactivity of oxygen atoms was found to be independent of the precursor nature. In addition, the formation of HOCO radicals was observed in all the noble-gas matrices at remarkably low temperatures. The IR spectra of HOCO and DOCO were first characterized in krypton and xenon matrices. It was concluded that the formation of HOCO was mainly due to the radiation-induced evolution of the weakly bound H2O···CO2 complexes. This result indicates the significance of weak intermolecular interactions in the radiation-induced chemical processes in inert low-temperature media. D. N. Laikov. A new parametrizable model of molecular electronic structure. A.A. Zezin, V.B. Rogacheva, V.I. Feldman, P. Afanasiev, A.A. Zezin. From triple interpolyelectrolyte-metal complexes to polymer-metal nanocomposites. A. Domanskaya, A. V. Kobzarenko, E. Tsivion, L. Khriachtchev, V. I. Feldman, R. B. Gerber, M. Räsänen. Matrix-isolation and ab initio study of HXeCCH complexed with acetylene. V. I. Feldman, F. F. Sukhov, A. Yu. Orlov. Hydrogen atoms in solid xenon: trapping site structure, distribution and stability as revealed by EPR studies in monoisotopic and isotopically enriched xenon matrices. V. I. Feldman, F. F. Sukhov, E. A. Logacheva, A. Yu. Orlov, I. V. Tyulpina, D. A. Tyurin. Reactions of H atoms produced by electron irradiation of benzene in solid xenon. K. B. Nuzhdin, S. V. Nesterov, D. A. Tyurin, V. I. Feldman, L. Wei, A. Lund. Structure of radicals cations of saturated heterocyclic compounds with two heteroatoms as studied by electron paramagnetic resonance, electron-nuclear double resonance, and density functional theory calculations. O. A. Zakurdaeva, S. V. Nesterov, V. I. Feldman. Radiation-chemical synthesis of polyethylene oxide hydrogel containing DCH18C6: A new approach. A. A. Zezin, V. I. Feldman, J. M. Warman, J. Wildeman, G. Hadziioannou. EPR study of positive holes on phenylene vinylene chains: from dimer to polymer. V. I. Feldman, F. F. Sukhov, A. Yu. Orlov, I. V. Tyulpina. Stabilisation and reactions of aliphatic radical cations produced by fast electron irradiation in solid argon matrices. L. Khriachtchev, H. Tanskanen, M. Pettersson, M. Rasanen, V. Feldman, F. Sukhov, A. Orlov, A. Shestakov. Isotopic effect in thermal mobility of atomic hydrogen in solid xenon. W. Knolle, V. I. Feldman, I. Yanovsky, S. Naumov, H. Langguth, F. F. Sukhov, A. Yu. Orlov. EPR Study of Methyl and Ethyl Acrylate Radical Cations and Their Transformations in Low-Temperature Matrices. V. I. Feldman, F. F. Sukhov, A. Yu. Orlov, R. Kadam, Y. Itagaki, A. Lund. Effect of matrix and substituent on the electronic structure of trapped benzene radical cations. V. I. Feldman, F. F. Sukhov, A. Yu. Orlov, N. A. Shmakova. Effect of Matrix Electronic Characteristics on Trapping and Degradation of Organic Radical Cations in Solid Rare Gases: A Case Study of Methylal Radical Cation.